For nine colorful days in October, the New Mexico skies are painted as hundreds of balloons lift off from Albuquerque’s Balloon Fiesta Park. Whimsical special shapes and Balloon Glows create a magical landscape for spectators to wander. 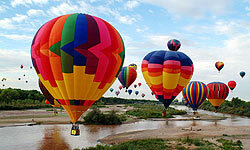 Purchase tickets, volunteer, sign-up for balloon rides, join the RV posse and more at the Albuquerque Balloon Fiesta! OR stay in beautiful Santa Fe. Book a double room for the week during the annual balloon festival at the special Legacy Club rate of $199 from October 4th to October 8th. Book now before September 30, 2009 using promotional code BWLCLO. Call the Reservations desk at (800) 272-5531.